Earlier this week when I was organizing my sketchbooks, I came across a Strathmore toned spiralbound book that I had used during life drawing only a few times. Most of it was still unused. Although I’m not crazy about the paper (I much prefer Stillman & Birn Nova), I like the size and format, so I threw it into the bag I take to life drawing. On Thursday our model was Randy, a long-time Gage regular whom I’ve drawn many times. During the break, I started thumbing through the Strathmore sketchbook and found several sketches of Randy that were dated March 14, 2013 – almost exactly five years ago. 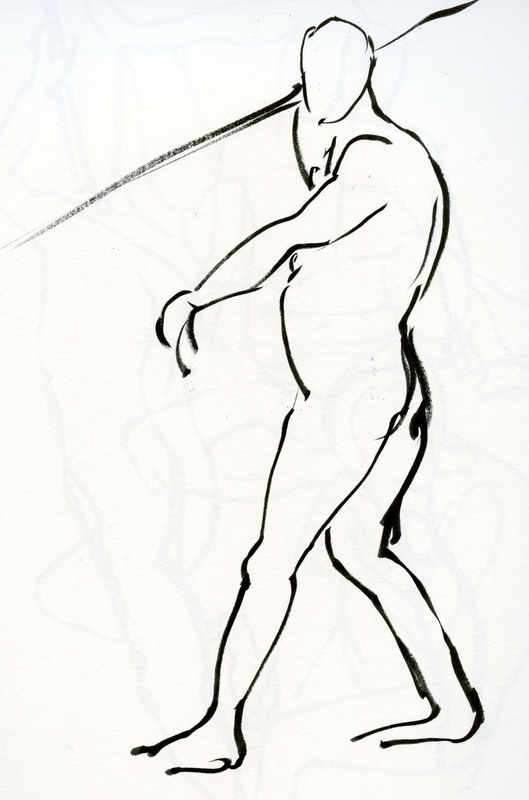 I found one pose that I had drawn from a particularly awkward angle, giving me a view straight up his nostrils. I remembered it because I had written a blog post about that foreshortened nose. Laughing when I showed it to him, Randy said he had just been thinking he would take that very same reclining pose for the next 20 minutes! And he did, just for me. I could have moved my chair to a different location to avoid that awkward view, but now it’s a tradition (top of page). I’ll remind him of it five years from now. Shown at right is the one I did in 2013. Below are a few more sketches of Randy from Thursday. 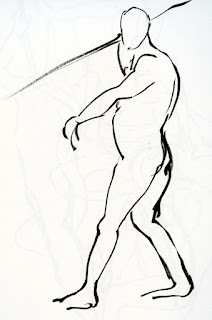 It is great to see how far your figure drawing has come!!! Nicely done! Thank you for noticing my progress, Joan! I've been working on it more regularly this year!